Megan's Men: Who Is More Controlling, Her Dad Or Her Husband? PLAYING Megan’s Men: Who Is More Controlling, Her Dad Or Her Husband? Allen says he and his daughter, Megan, were close her entire life until she met her husband, Jim, when she was 18 and Jim was 26. He claims Jim controls Megan and alleges Jim has physically attacked him. He says Jim has gone out of his way to turn his only daughter against him and that all he wants is for his daughter and grandchildren to be back in his life. 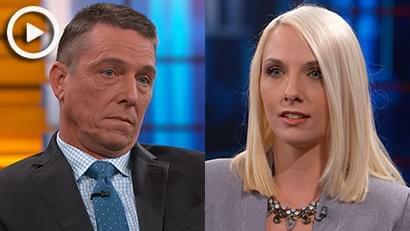 Megan denies that her husband is controlling and says she cut her father out of her life because of what she and her husband say are his poor choices. Can Dr. Phil help this feuding family come to a truce so that Allen can see his grandkids?